After over six years the project to improve physical access and understanding of the whole Priory site, together with the conservation of the medieval gatehouse structure, precinct wall and features of the north aisle wall, has been completed. On Sunday 17th May 2009, the Bishop of Norwich led the congregation of over two hundred in a service of thanksgiving. In his sermon he stressed the importance of the parish church as belonging to all parishioners. 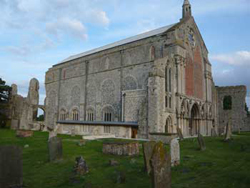 The contributions and support of the project by a vast number of individuals and local organisations testify to the special affection so many have for the Priory. As well as all the local support the project could not have been implemented without the very generous grants from Heritage Lottery Fund, English Heritage and many other funding agencies. The 12th century building now has 21st century additions created by talented designers and craftsmen. 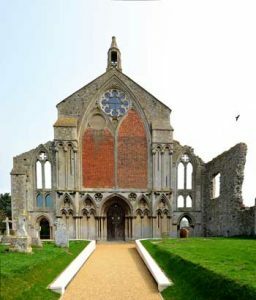 The challenge of the future is to ensure that the Priory is maintained in good condition as a spiritual site for worship, enlightenment and enjoyment, open to all in the best tradition of the Benedictine monks who built it nine hundred years ago. 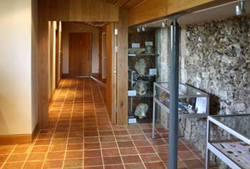 The tradition of Benedictine Hospitality for all is exemplified in the new path to the Priory, which is designed to make access easier for those with disabilities; the new porch conserves the old medieval porch which was the regular entrance into the Priory for members of the parish and visitors throughout the ages; there are new toilet facilities including one which is for the disabled and can be used as a 'changing facility' for small children. This is all surrounded by fascinating displays of artifacts, stained glass and masonry which have been recovered in previous archaeological excavations from the ancient Priory. 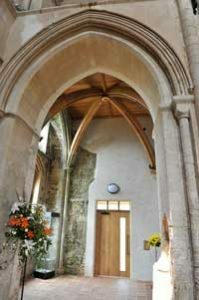 In the porch, the vaulting has reproduced as faithfully as possible (though in wood) the original, attaching itself to the springs and following their curves. 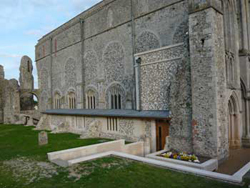 Originally the normal entrance into the priory, the Holy-water stoup can just be seen on the right hand side of the picture, let into the pillar. It was the custom to either sprinkle yourself, or make the sign of the cross on your body with the water as a symbol of purification on entering the church. The practice was general in England before the Norman Conquest, and was in current use in the west c. 4C. The stoups were often richly ornamented, either in stone or with wooden painted panels.